If you think about the lengthy tour cycles independent artists embark on these days–for either the love of doing so, or at least the love of breaking even–it’s hard to not imagine even the most diligent, happily nomadic acts becoming bored with some of the material they run through every night. However, it’s undoubtedly a puzzle to figure out ways to revise and revamp old songs without subverting the original spark that gave them power. For many artists, finding an inspired way to treat their compositions as fluid templates while still rendering a convincing version of The Song becomes a frequent creative exercise. To pay tribute to artists attempting this exercise, Domino Records has launched Documents, a series of live-in-studio performances with little to no touch-ups, aiming at encapsulating the sound of a live band at a particular, slightly unstable point in time. Los Angeles singer-songwriter Julia Holter and her band were the first to formally accept the label’s challenge, and luckily, In The Same Room, her new Documents full-length, finds her quartet of choice at the peak of their working relationship. Their relationship toward the material seems both effortless and appealingly restless, as the band’s arrangements push and pull between fairly faithful, if slightly more agitated, renditions and radical reinterpretations of songs from three of her studio albums: Loud City Song, Tragedy, and Have You in My Wilderness. (Sorry, Ekstasis fans.) But what they all do, without fail, is to invest much of this material with a provocative energy that is discrete from Holter’s studio recordings. Ultimately, this energy results in In the Same Room being as crucial an entry into Holter’s still-unblemished catalogue as any of her proper LPs. 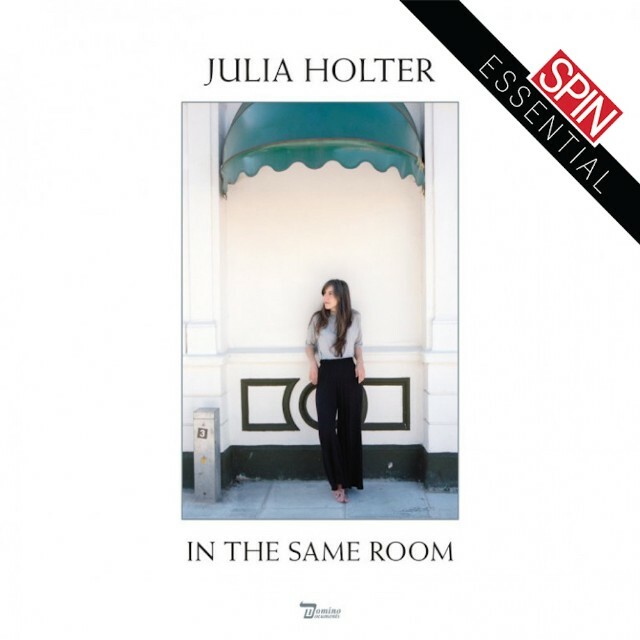 Holter’s piano usually defines the rhythm and atmosphere of these arrangements, and it comes through more prominently on any of her previous albums. She sometimes re-punctuates the songs rhythmically (the whimsical syncopations in “Silhouette”) or branches off into wayward, high-end improvisations, creating destabilizing ripples through the rest of the band (the Alice Coltrane-like clusters that open the album on “Horns Surrounding Me”). The drumming, as it has increasingly been on Holter’s last two (and best) albums, is heavily jazz-influenced. Both Holter and her default drummer Corey Fogel are familiar enough with the subtlest emphases in the original songs that they are comfortable subverting them, and they rarely stick to simply keeping time in their playing. The band seems to be branching out not just to keep things interesting for themselves, but to see if what materializes from their process of substitution and subtraction will feel like a meaningful new product. It does: Almost without exception, the renditions on In the Same Room hold an appeal distinguishable from the original recordings. It’s even conceivable that fans, in some or many cases, may prefer the stark, imperfect vocal performances and moments of jammy bedlam to Holter’s more austere, subtly layered studio approach. At the very least, both versions of these songs are distinct entities with their own sharpness of purpose. On In the Same Room, “Lucille Stranded on the Island” fractures into a more complete free fall in its dizzying middle section. It’s a carefully orchestrated musical shipwreck, but the band manages to fall back together when it has to. “So Lillies”’s final moments, in which viola screeches are pitted against a dirge-like, disintegrating groove, evokes John Cale’s most dissonant contributions to the Velvet Underground; the end of “Vasquez” veers into open-form spiritual jazz, invested with some New Age impressions. It’s all inspired give-and-take–born of a tight working relationship, accommodated by the limitations and freedom of working inside a intimate quartet in which there’s no room for any given player to hide. These songs, in particular, build to moments unlike anything you’ll hear on Holter’s studio albums. There are moments where, in tweaking her arrangements, Holter alters the entire dramatic arc of a given song. The Joni-Mitchell-indebted “In The Green Wild” gets the most unexpected makeover. Its cathartic middle section is stripped of the recording’s lush synth accompaniment, centered instead around Holter’s tenuous, eerie piano melody and Dina Maccabee’s stratospheric viola wails and creaks. At moments like these, Holter is doing more than just rewriting details or making room for a few more solos. Holter’s songforms aren’t based on rising action to cathartic choruses; they’re more symphonic, comprised of long sections dominated by one ear-catching melodic motif or a distinctive texture. At moments like this on In the Same Room, it feels like Holter is making a concerted effort to re-storyboard her movements. Holter’s voice, too, sounds different than ever before on record. One can hear the wavering of her voice as she moves slightly back and forth from the mic; her delivery is bolder and more haphazard, holding our attention at every tenuous turn. The reverb on her voice is scaled back, clarifying her more charming, conversational lyrics, and the songs’ theatrical implications shine through. She opens “How Long?” in a husky contralto evoking Marlene Dietrich, and ends in a plaintive, airy head voice suited to singing 16th-century madrigals. “Betsy on the Roof” finds Holter nearly hoarse; her notes are clipped more than usual, and sometimes seem forced through. The result is a poignant and intense performance which invests the chorus’ recurring plea of “Won’t you please tell me the answer?” with a newfound desperation. In the closing section, she rephrases as the line insistently over the baroque melodic thread in the viola and piano, as the bass and drums seize up and splinter underneath. The song is a full-fledged microdrama, in which the vocal characterization, lyrics, and instrumental interplay all play an equally integral part–a microcosm of everything that makes this album great. In the Same Room calls into question the idea of what the “true,” essential form of a composition is–if that concept is sound, or matters at all. The album presses pause on Holter and her band at an uncomfortable moment of transience–when their relationship to these years-old songs is clearly comfortable but also mildly antagonistic. However, they still manage to bring out the richest valences of Holter’s pristine and eccentric songs, and more than ever before, communicate her incredible skill as a passionate, intuitive, and controlled performer.